Anybody seen the movie, "Hachi" yet? To all Chow lovers and dog lovers, this movie will really get to you heart. It is based on a true story about an Akita, Japenese dog, and his owner. Richard Gere stars in this. If you see it, make sure you have your Kleenex at hand. It truly shows what I've already said before, you can't fathom the love of a dog. This story proves it beyond a doubt. Re: Anybody seen the movie, "Hachi" yet? Thanks for the reminder to get it on DVD. I didn't know it was out already!!! Very much looking forward to it. Love the story of the Hachi the Akita. Our Bridge Girl Shadie was mostly akita with some German Shepard and was sooo loyal. All, here's a synopsis and reviews on it. Highly rated, wow! I Wanna Go Chase Something!!!!! Watched it last week, reallly nice film and in places very very sad - certainly as it draws to a close. Would like to say my 2 are like that but if they ever got out the garden they'd just run off and crap somewhere..... In fact with Max being the way he is he's probably try and make friends with the front of the train in the story, The film that got me (and Im not afraid to say it) was Marley and Me. I really really can't watch that film again. Had to use the old "something in my eye" excuse ha ha. I think I can completely emphasise with that story, we had a GSD for about 12 years and I used to go and do everything with her. To someone looking from the outside (these days) she probably would have been destroyed. I used to lie on the lounge floor watching TV and she would walk into the room pretending to ignore me, then suddenly change at last minute jump on my back and kind of put my whole head in her mouth like a circus trick lol. Never ever hurt me but she was an absolute handful and loved her to bits. I'm pretty strange in that I very rarely get over emotional as far as people go however when I think of that dog in any way it brings a tear to my eyes. She would do anything and was so protective of her family yet quite accepting of people providing you told her it was okay. 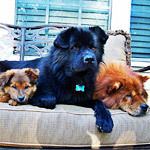 Of course Chows are completely different! But I love my pair just as much although I really hope with Max turning 6 this year he might grow up a bit.......I live in hope. I haven't seen it yet, but I want to. Such a sad movie, Winston was upset as well. Last edited by SWANCIN on Mon Mar 22, 2010 7:25 pm, edited 2 times in total. My daughter got the movie and is bringing it over for our usual Friday night dinner night. I did see Marley & Me and that was sad but I handled it okay so I'm hoping Hachi won't do me in...My mom had an Akita...he was the sweetest boy ever. My parents were devastated when he crossed the bridge (old age). kingalls wrote: My daughter got the movie and is bringing it over for our usual Friday night dinner night. I did see Marley & Me and that was sad but I handled it okay so I'm hoping Hachi won't do me in...My mom had an Akita...he was the sweetest boy ever. My parents were devastated when he crossed the bridge (old age). I loved the movie. Very few (like 3) movies have made my fiance and I cry. Two of those, Hachi and Marley and Me, you've all mentioned. Even my fiance agreed that the reason it made us both cry is because now we know what the loyalty and companionship feels like. We're both going to be a mess when we lose ours. Hopefully that won't be for a VERY VERY long time! I know Keeta would be nothing like Hachi, he would probably care less as long as someone else took him for walks and gave him food (after all he did live on his own for awhile). Kenzie on the other hand, would probably wind up dying herself. I know she wouldn't go back there every day (but she probably never would have done that in the first place), she's more of the curl up in a corner, get depressed, and die due to lack of eating (I'm judging this based on how she acts when I go away for business and I talk to her over the phone while I'm gone). OMG! I have just watched this film, it was on MC1 tonight. I still have leaky eyes and OH keeps asking why we had to watch it, when we knew it was going to be sad. He thinks it's worse because we have a loyal dog, he said Henry would wait at the window for me every night. I still haven't see the movie... But I told my mom I wanted it when we saw the DVD sitting on the shelf at Walmart today. Just make sure you have a box of kleenex handy, my eyes started leaking less than halfway through. That is my favourite film of all times. I have watched it 5 times and cried like a baby every single time I have watched it. It is an amazing story. Definitely worth a watch for any dog lover. My hat goes off to you for watching it so many times. I couldn't watch it again I don't think, far too sad, still upset this morning.